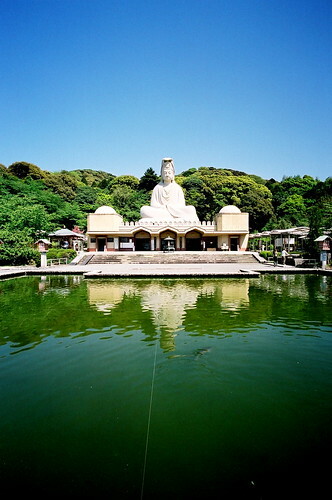 In commemoration of those Japanese who sacrificed themselves in the last war and for the establishment of a peaceful Japan, this concrete statue of the compassionate Bodhisattva Avalokitesvara (Kwannon) was erected by the late Hirosuke Ishikwawa. World peace and universal brotherhood. Could this be any more self-contradictory and confused? And yet, the desire for peace among the general population in Japan is one of the strongest that I’ve encountered anywhere. Despite the nationalists’ black vans, despite desires to revise Article 9 of the Japanese constitution, despite the subtle (and sometimes not so subtle) racism on display among certain segments of the population, there’s a genuine sense that a peaceful, more equitable world is both possible and desirable. This is a sense that seems to have vanished in the States where it seems that the only possible view of world affairs involves perpetual war and uneasy truces. Of course, the goals of the political elite and the desires of the general population are often in conflict — perhaps no more clearly displayed than in Okinawa’s desire for the U.S. military to leave, and Tokyo’s refusal to let local referendums on the subject (overwhelmingly rejecting U.S. presence) deter its desire to retain the U.S. as an ally. These memorial items are to be found, along with thousands of Jizo statues, in the Mizugo Jizoson area to the right of the main temple. 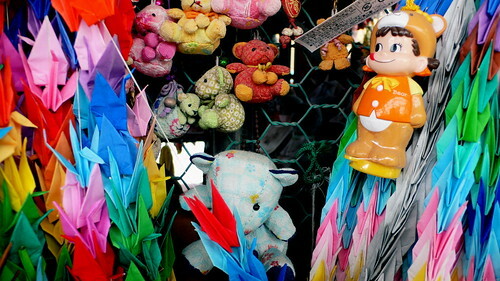 I’m not sure what the significance of the children’s toys is. 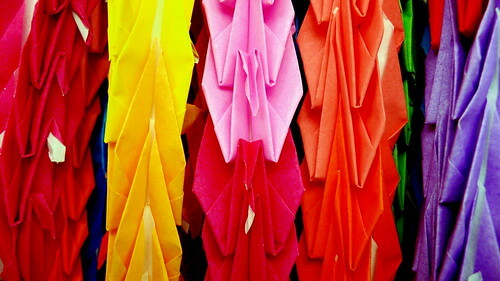 Here is a closeup of strings of paper cranes memorializing the dead. 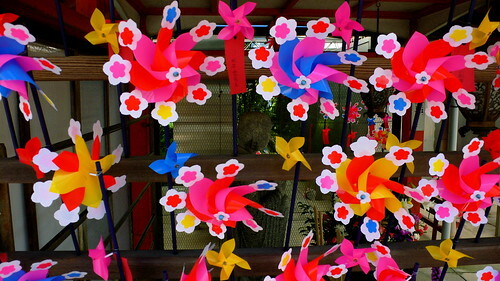 These colorful windmills surround a sitting Jizo figure. 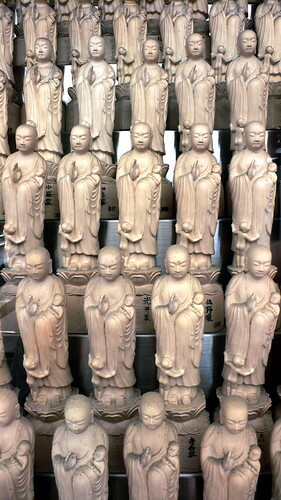 Here is a view of a section of one of the cases that hold thousands of identical Jizo figures. 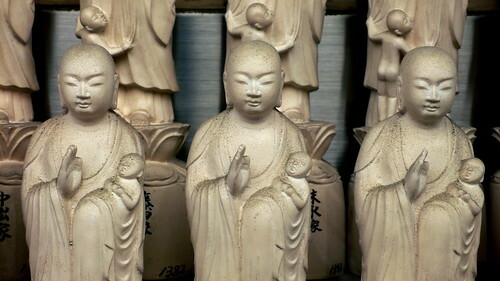 A closeup of the Jizo figures. Jess and I kept getting told by the priests working at the temple to ‘go round back,’ but there didn’t seem to be much to be seen (aside from “Japan’s largest stone footprint of the Buddha”) until we noticed the steps going up inside the body of the enormous Kannon statue topping the temple. 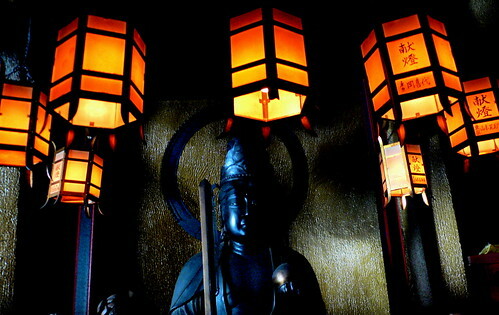 In fact, it’s possible to enter the body of Kannon, which is a dark core filled with floating lanterns and silent, haloed guardians. 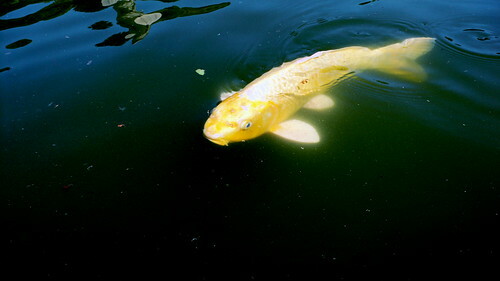 A glowing ghost carp swims in the pool in front of Ryozen Kannon.